In early April, 5-8, my former PhD student and life-long friend Sasha Vojkovic, professor of Film and performance Studies in Zagreb, had organized a three-day conference together with her colleague Sibila Petlevski. The title, Narratology and its Discontents, suggested a critical engagement with the field that has marked by beginning as a scholar, back in the 1970s. I accepted the invitation, first of all for Sasha’s sake, but then also to rethink my own position in the field I have never really left behind, even if I have brought it to bear on so many other things. I was really happy to get the opportunity to do this, and realize I still find the theoretical refinements and the need to enhance relevance of narrtive theory very important. Among the many brilliant and lovely people I met there, the scholar, filmmaker and photographer Mischa Twitchin sent me this photograph, which beautifully conveys the layered history of Zagreb, the city’s engagement with Europe whose history it shares, as well as more recent turbulence. 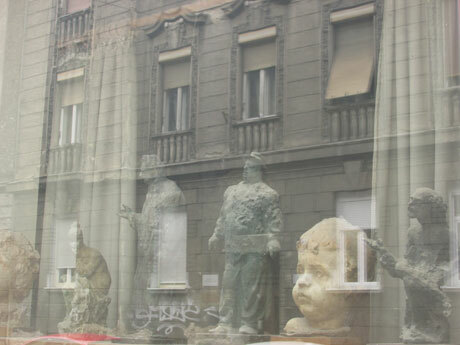 The way Mischa incorporates the past in a street-window is right up my alley. In my own lecture I developed thoughts on the importance of narratology for what is less and less easily called “post-colonial” theory and analysis. It is time to come up with a more honest term, that does not suggest “post-” means that what follows belongs to the past, but instead acknowledges our ongoing complicity with the enduring colonizations in the world. My lecture was titled “In the Absence of Post-“. The national television broadcast an interview - don’t mind if you don’t understand Croatian, I speak in English. If you are interested, you can watch it below.